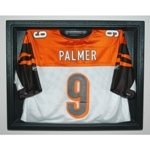 Single baseball soft mini glove acrylic display case. Price includes 1 free nameplate. If no nameplate is wanted, simply leave that field blank. 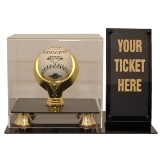 Single baseball & ticket holder acrylic display case with gold ring and risers. Price includes 1 free nameplate. If no nameplate is wanted, simply leave that field blank. back and the acrylic lid features the team logo. Measures 5 1/4"W X 5 3/4"D X 10 1/8"H.
Made in USA. World Series Baseball Included. Actual game scores will be engraved. 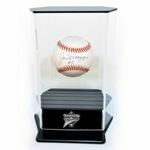 Now display your baseballs like never before, in the absolutely incredible floating case.